A story of romance between two people on the edge, As Good As It Gets is a thoughtful look at what it takes to uncover the warmth beneath complex, harried and damaged souls. 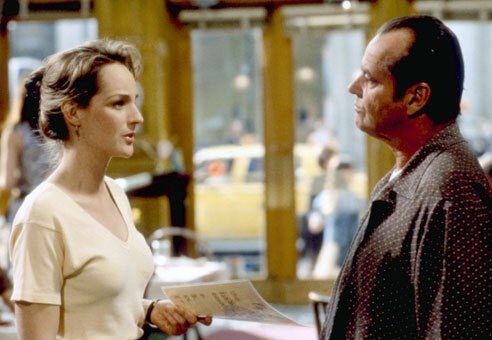 Jack Nicholson and Helen Hunt shine as agitated New Yorkers wrapped up in their lives, not looking for love but finding it flickering under the unlikeliest of circumstances. Melvin Udall (Nicholson) is a New York-based writer. He is also intolerably obsessive-compulsive, racist, anti-Semitic, and homophobic. Melvin lives in an apartment building, where his neighbour is gay artist Simon Bishop (Greg Kinnear), who has a black marketing agent Frank Sachs (Cuba Gooding, Jr.). Simon and Frank take the brunt of Melvin's insufferable behaviour, as does Simon's dog Verdell. Melvin's fanatical routine includes eating breakfast daily as the same restaurant, sitting at the same table, and getting served by the same waitress, Carol Connelly (Hunt). A poor single mom of a sickly child, Carol in the only person who can tolerate Melvin, and in turn, he recognizes that he is dependant on her. When Carol starts skipping work to look after her son Spencer (Jesse James), Melvin arranges to pay for high quality medical care to stabilize Spencer's condition, so that Carol can return to work and serve him breakfast. Simon is brutally mugged, and Frank insists that Melvin take care of Verdell, but Melvin's growing fondness for Carol prompts him to start taking his medication to improve his social skills, and he starts to cope better around people (and dogs). Melvin's relationship with Carol evolves slowly, with his deeply ingrained suspicion of people clumsily colliding with her desperate need for intimacy. Eventually Melvin, the battered Simon and Carol head out on a road trip to visit Simon's parents, and both Melvin and Carol need to confront their true emotions towards themselves and each other. 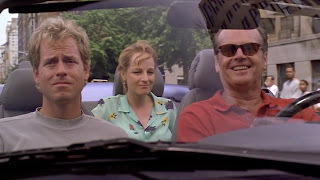 Under the direction of James L. Brooks, As Good As It Gets shines as a study of two desperately lost souls whose destinies collide over bacon and eggs, with Jack Nicholson and Helen Hunt both receiving best acting Academy Awards. Nicholson pulls out one of his most memorable performances to bring Melvin to life, a man deeply aware of his failings but standing just short of being able to address them, until he sees first in Verdell and then in Carol a reason to risk radical change. Nicholson makes impressive use of pauses, his eyes beaming with what he needs to say in order to join humanity's norms, but his mouth only able to spout the poison that creates a lonely vacuum around him. Hunt is impressively equal to Nicholson, and rises to the challenge posed by the script (co-written by Mark Andrus and Brooks): it would have been too easy for Carol to be all-good opposite Melvin's radical offensiveness. Instead, Carol has deep-rooted issues of her own, and her desperation for companionship and a true partner in life allows her as many opportunities as Melvin to take painful missteps in their stuttering relationship. 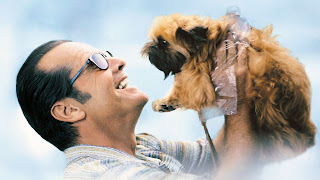 Greg Kinnear and Cuba Gooding, Jr. add memorably chaotic New York life to Melvin's surroundings, while Shirley Knight as Carol's mom is instrumental in steering her daughter towards some painful but necessary decisions. As Good As It Gets suffers from some bloating at close to 140 minutes for a romance, and Brooks could have benefited from sharper decisions in the editing room. Some realism is also sacrificed with the speed of Melvin's transition from reclusive and repugnant to half-way cuddlesome. But whenever either Nicholson or Hunt are on-screen the momentum is maintained, and As Good As It Gets proves to be plenty good enough.